Since 2000, SCOTTeVEST has revolutionized the clothing industry with a very simple idea: people need more (and “smarter”) pockets! 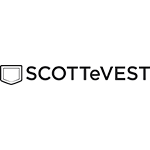 Anyone with a mobile lifestyle, from professionals on the go, technophiles, outdoor adventurers to just all-around busy people, can use SCOTTeVEST clothing to free up the clutter in their lives and focus on the moment, not where their stuff is (or isn’t). For more information, visit www.scottevest.com.